Halfway through its inaugural season, the Los Angeles Kings High School Hockey League is, by all accounts, off to a rousing start, and all indications are that the league is building a solid foundation that should enable it to expand well into the future. Established on the model of the highly-successful high school league started by the Anaheim Ducks, which began with just one team in 2008 and now boasts a whopping 48, the Kings’ league is essentially a northern version – serving an area that not only is more closely associated with the Kings’ fan base, but is geographically more palatable for families in L.A. and its northern suburbs. The eight-team league includes the Santa Barbara Royals, South County Aviators, El Segundo Strikers, West Ranch Wildcats, Kern County Knights, East County Outlaws, San Gabriel Valley Cougars and Santa Clarita Cobras. “When (Kings president of business operations) Luc Robitaille asked me to be involved with this, I thought it was a great idea,” said Jim Fox, who serves as the league’s commissioner in addition to his role as a TV analyst for the NHL team. “A big part of his plan is to grow the game, and this is an important element of that initiative. Through early January, the Royals led the league with a 9-0 record, while the Aviators were 5-2 and both the Wildcats and Knights held 5-3 records. The regular season started on Sept. 25 and will run through March 5, followed by semifinal games on March 11-12 and a championship game on the afternoon of March 19 at Staples Center. Fox believes that hosting the championship game on the Kings’ home ice – the big club plays the Boston Bruins there that night – is a pretty big deal for the league, and he knows it adds some excitement and extra motivation for the teams in the playoff hunt. “Who knows? Maybe 10 years down the road, Staples Center is sold out for the high school championship game,” Fox said. In addition to the chance to play on NHL ice, the league has added an aura of professionalism with a unique video offering. Just like the Anaheim Ducks High School Hockey League, all games in the Kings’ high school circuit are streamed live by Black Dog Enterprises on the league’s Web site, and are available to watch on-demand later. The video streaming service is good not only for exposure, but also a helpful resource for coaching and scouting. 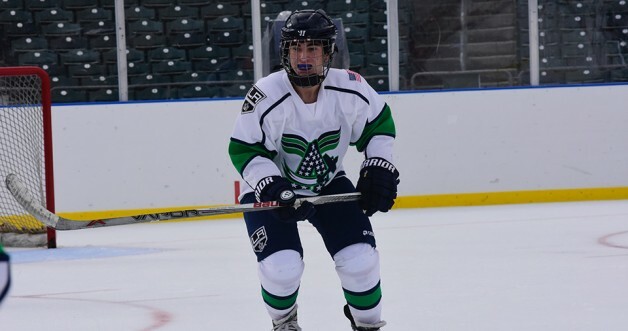 The high school league differs from tier hockey in that not every player is acutely focused on advancing to the next level – whether it be juniors or college hockey. Even though most of the teams are made up of players from a handful of schools in their geographic area, there’s a sense that they’re playing for their “hometown team,” and that feeling should continue to grow if participation increases to the point where additional squads become “pure” teams made up of players exclusively from one school. Currently, West Ranch is the only pure team in the league. Aydin Schewtz is a center and captain for the Aviators, who play their home games at Iceoplex Simi Valley and draw players mostly from the Thousand Oaks area. He grew up playing roller hockey before switching over to ice with the Ventura Mariners and California Titans programs at age 12. Now 16 and a high school junior, he’s happy to have the opportunity to play in a high school league. “The Ducks league has always been really well-run, and I’ve had some friends play there, so when I heard the Kings were going to do something similar, I wanted to be a part of it,” Schwetz said. While the level of competition may not be as intense as AAA or even AA travel hockey, the Kings’ high school league offers less-experienced players the opportunity to be part of a team, learn the game and develop their skills. “I think the league allows kids to play who might not have otherwise, either for financial reasons or whatever the case,” said Martin Raymond, who’s coaching the Santa Clarita team this year after taking a step back from the professional ranks, where he coached in the West Coast Hockey League, ECHL and European leagues. Steve Heinze moved to Santa Barbara after his 12-year NHL career concluded with two seasons in L.A., and helped open a new rink there within the last year. He now coaches the league-leading Royals and has seen firsthand the benefits his players get from toiling in the Kings’ league. “It’s been great so far,” he said. “I know the kids are getting better, and I think they’re having fun doing it. How quickly the Kings’ league expands is anybody’s guess, and of course future expansion is limited by the availability of ice time. But the positive response so far is certainly a good sign, and it’s clear the Kings will do everything they can to ensure the league’s success. Photo/Toby Schwartz, a freshman at Calabasas High School playing for the South County Aviators, is one of many players benefiting from the camaraderie and competition offered in the first-year Los Angeles Kings High School Hockey League. Photo/Cyberlaff Inc.